Last month’s article discussed my efforts to get the bonnet ready for painting. This month we look at application of modern urethane paints. 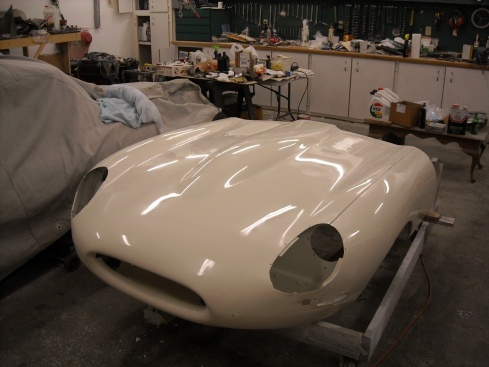 In its day, the E-Type was most likely painted with enamel paints. 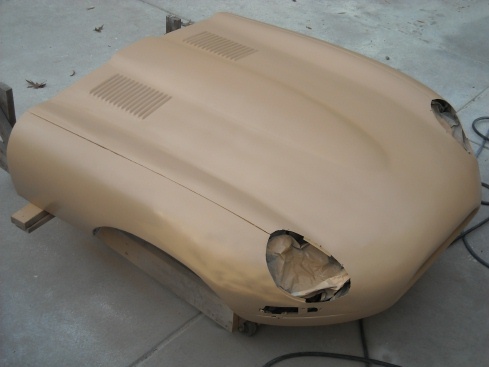 For a variety of reasons, enamel paints are no longer used for automotive painting. One main reason is that they just not as durable as modern paint systems. 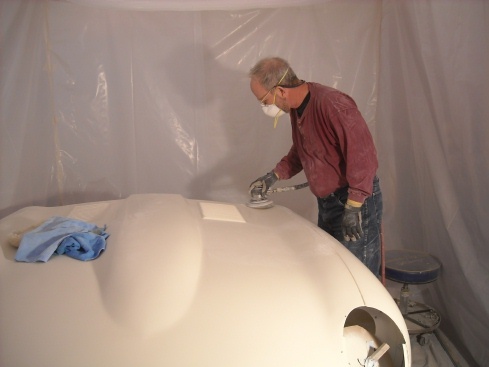 Most cars now days are painted with a urethane paint system. 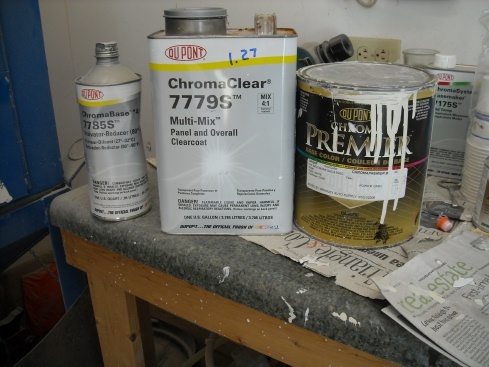 Urethane paint activates chemically with a catalyst action. Simply this means that the molecules of the paint interact with each other to “cure”, rather than just “drying” by evaporation of water or solvents. The net result is a paint that is far more resistant to UV light, chemicals, and plain old wear and tear. Furthermore, the paints are developed as a system. 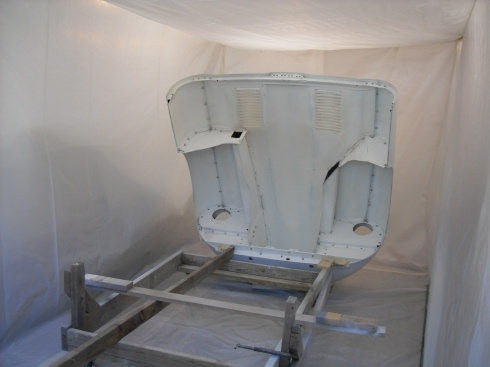 Direct to bare metal one applies an epoxy primer coat that grips tenaciously. Next, layers of high build primer/surfacer are put on that are relatively soft but can be sanded to a very flat, level surface. This layer is sanded to a very smooth surface using gradually finer and finer grades of sandpaper. Once all this prep work is done, the surface is finally ready for the layers that really count. 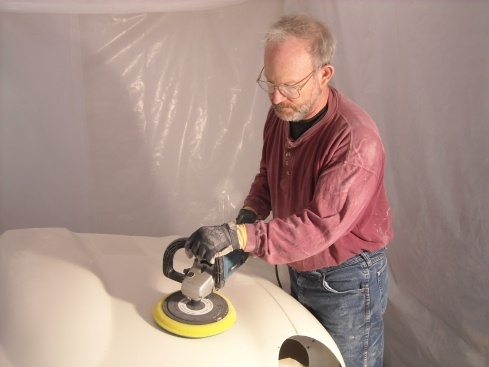 Most high end car paint finishes use a “base coat / clear coat” system. The base coat is the color that you see. When sprayed, the base coat shows the color you want but has a very dull finish. Next and finally, the clear coat is applied. This coat is exactly as its sounds. You can see right through it to the color coat underneath. The clear coat provides the shine and the last layer of protection from the elements. Most factory paint jobs let the clear coat dry and that’s it. A final step that is only cost effective for show cars, or when someone can provide their own sweat equity, is sanding and buffing of the clear coat to provide an extremely flat, extremely reflective surface. This is done using very fine sandpapers (think 1500 grade and finer) followed by buffing with liquid compounds. The results can be quite stunning when done correctly. Following is a pictorial of some of these steps as applied to my bonnet. 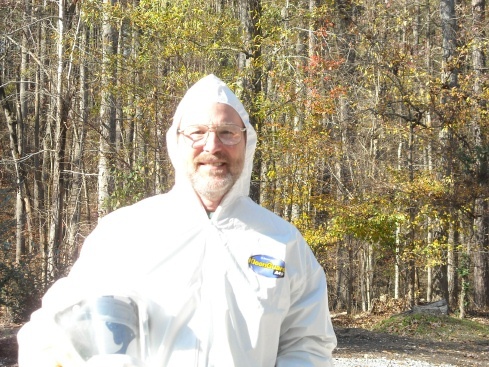 Painters suit up for protection. I have a supplied air hood system. Base coat on the right. Clear coat on the left. Both are multi-part mixes. Base coat and clear coat applied. Now its time for sanding with a random orbital sander to remove orange peel and other defects. Buffing after sanding, using liquid compounds with very fine cutting grits. Its done and looking great! paint jobs are so expensive.